Programme& B.Ed. (DM) Additional Methodology. 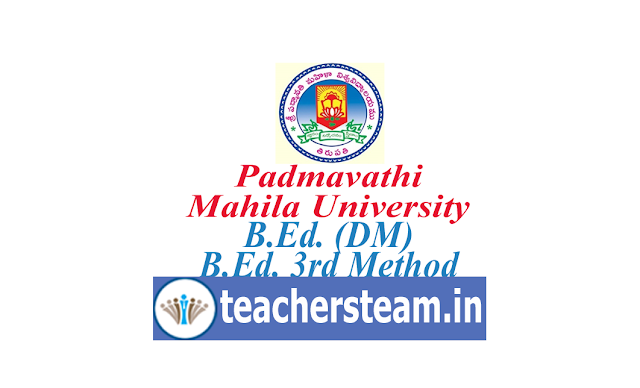 Candidates can apply to Directorate of Distance Education, Sri Padmavati Mahila Visvavidyalayam from the date of this notification. For details of eligibility, fee structure, application, Prospectus and list of study centres please scroll down this page. Last date for submission of application is 12th November,2018. Download the Application which is attached at bottom of this page and submit the filled in applications along with the enclosures and a crossed demand draft of any Nationalized Bank for Rs. 600/- drawn in favour of “The Registrar, Sri PadmavatiMahilaVisvavidyalayam, Tirupati,” payable at Tirupati towards Registration fee. Trained in-service women teachers in Elementary Education with a minimum of 50% of marks in UG or in PG Degree. However, the candidates belonging to all other reserved categories i.e S.C.,S.T.,B.C (A/B/C/D/E), and Physically handicapped should have secured a minimum of 40% marks in the qualifying examination. As per the GOMS NO:92, the candidates who passed B.B..S/B.D.S/B.A.M.S/B.L/L.L.B/B.A(Languages)/B.O.L etc. and other such professional courses are not eligible for admission into B.Ed course. Teachers called for interview should submit their ‘Service Certificates’ and ‘No Objection Certificate’ countersigned by the competent authorities/authorities concerned at the time of admission. Passed B.Ed. Degree from a recognized University with a relevant subject at UG level.